The Green Workplace: DC's "Bag Tax" Works! This January I wrote about DC's recent "bag tax" that requires all retail stores to charge $.05 for paper or plastic bags at the check out counter. 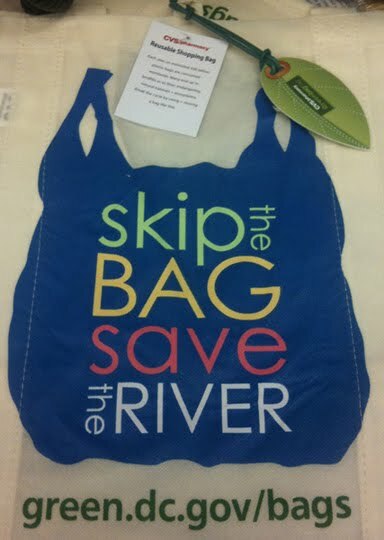 In addition to the cost of the bag, consumers are told they should "skip the bag and save the river," reducing pollution in DCs Potomac and Anacostia waterways. Retail outlets that typically use 68 million disposable bags per quarter handed out 11 million bags in the first quarter of this year and fewer than 13 million bags in the second quarter, according to the district's Office of Tax and Revenue. That may help explain why volunteers for the city's annual Potomac River Watershed Cleanup day in mid-April pulled 66% fewer plastic bags from the Anacostia River than they did last year. I write about community based marketing and behavior change techniques all the time, but in this particular case, I really paid attention to my own behavior. At first, I definitely reduced the number of bags I took home due to cost. If I didn't have a reusable bag with me, I would carry things in my pockets or stuff them in my computer bag. Whatever it took to not pay for a cheap and frankly ugly bag. After a while though, I've noticed that its really "uncool" at the store to pay for bags anymore. There really is a kind of peer pressure around the city... people who have to buy bags are considered "wasteful" or "thoughtless." Honestly I had my doubts this would be effective, but the 1-2 punch of the pro-environment message and the immediate cost (awareness of the negative externalities) has really worked here. And this is a city with LOTS of outsiders from across America visiting everyday. Let's hope they take this idea home with them! We generally take our own home made bag while visiting a shop. This saves us from the cost of buying bags and also reduces carbon footprint by not using paper or plastic bags. If something has a monetary price, we seem to value it more or at least consider its valuation. But for me, the move away from plastic bags is driven by the notion that I am doing the right thing and the fact that the change is so easy. karen millen dresses, many people imaging! Nearly every last lady whom really loves charm must turn to be situated of skirts.